Turn of the 20th century Saratoga Springs was coming to terms with the steady decline in its popularity as a resort and conference destination. Automobiles, stricter gambling laws, and changing leisure activities all tempted visitors to other destinations. Hoping to reinvent its image and assert its place as an upstate New York hub for industry, town leaders began several projects to conserve the mineral springs—the original nineteenth-century attraction—and bring the visitors back. 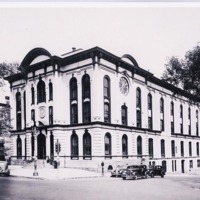 The defining moment for the town’s revitalization came with its incorporation as a city in 1915, which capped a period of municipal conservation efforts that included acquiring the Canfield Casino (1911) and Congress Hall Hotel (1913)-- leading to a public Congress Park, and developing the New York State Reservation (now Saratoga Spa State Park) (1911), which included downtown’s mineral springs. With these initiatives, the city took steps towards developing its urban center, while emphasizing community participation, transportation rerouting, and addressing the changing face of American tourism. 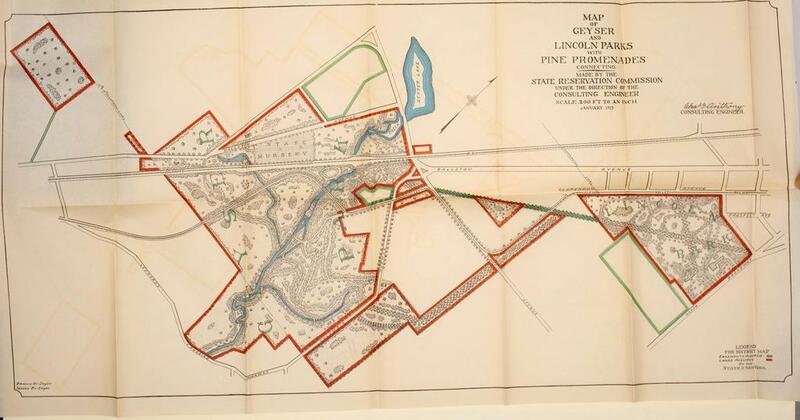 About these maps: Consulting Engineer Charles Anthony supervised J. Ziegler, who created this three-map series for the Sixth Annual Report of the Commissioners of the State Reservation of Saratoga Springs that provided a visual representation of the commission’s goals: conservation of springs, creation of parks, and renovation of bathhouses and bottling plants. 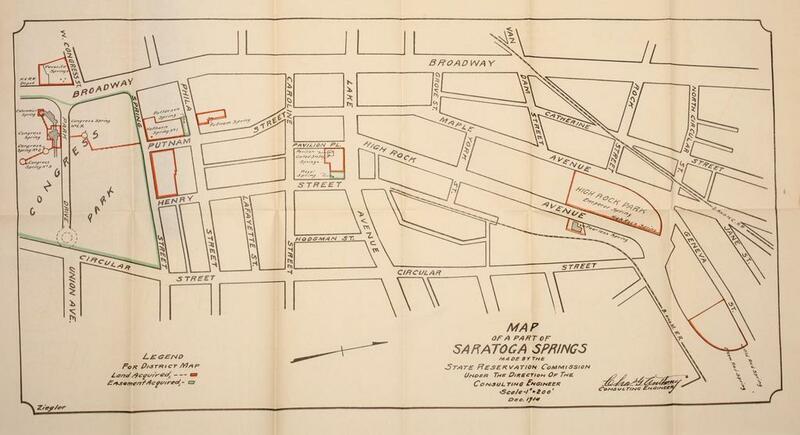 The 1915 City Charter laid out the framework for Saratoga Springs' transition from town and village to city. 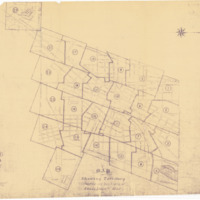 It described the inside and outside tax districts, as shown on City Engineer Samuel J. Mott's 1917 Outside District Map (commissioned by the City Council in 1915). 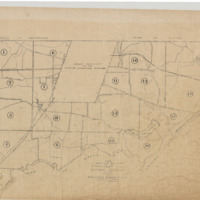 The perspective interestingly differs from the North-South view that Mott used in his planning map of downtown (1939), whose perspective was reused for decades. 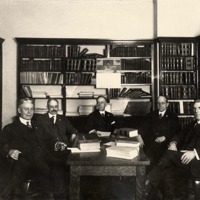 The first Saratoga Springs City Council members at a meeting in 1917: Walter P. Butler, Mayor and Commissioner of Public Affairs; Michael J. Mulqueen, Commissioner of Accounts; William H. Waterbury, Commissioner of Finance; N. R. Thompson, Commissioner of Public Works; and William B. Milliman, Commissioner of Public Safety.